The Lenoir County Board of Education is the 2017 recipient of the School Board Leadership Award. This award honors a school board for extraordinary leadership during the 2016-2017 school year. 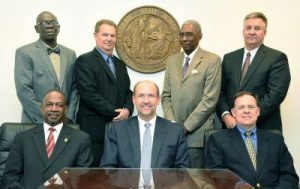 To receive this esteemed award, which is given by the North Carolina School Boards Association (NCSBA), a board must demonstrate excellent governance skills through commitment to the role of the school board. Lenoir County was recognized during the awards ceremony of the Association’s 48th Annual Conference for Board Member Development in Greensboro on November 14. During comments to ceremony attendees, the board was celebrated for the bold, innovative steps it has taken to lead the school system forward. The board’s commitment to a shared vision helped the system exit low-performing status, increase student proficiency in most schools, and develop its academic options to address the varying needs of students and parents.